In order to explain this drawing, I shall go on to what has been today’s most important event for me: The demonstration (of course encore une manif! It’s been more than three weeks since the last one…) against the new immigration policy which will be discussed in Parliament in three days. According to this new law, immigration to France should be “chosen” (immigration choisie) rather than “suffered from” or “undergone” (subie). In practice, this means that people who are useful to the French economy are invited in, while the law will be more restrictive on the others – the asylum-seekers, the family reunions and the unregistered sans-papiers. The labour party (PS) politician Christiane Taubira said on the news today that she had too much respect for humanity to accept even the notion immigration choisie. Activists have in a similar humanist vein renamed the government term immigration subie “disposable immigration” (immigration jetable). Either the political climate is hardening here, or I’ve just taken too long to grasp how far right the Interior Minister is willing to go. When the Votez Le Pen poster with Sarkozy’s photo appeared in January, I have to admit that I found it a too strong for my taste (on the other hand I could wholeheartedly appreciate the Sarkozy satire poster “When I hear the word banliue I reach for my Flash-ball (rubber bullet weapon)” and the Raspouteam stencil). But after Sarkozy’s two latest “love France or leave her” and the “If Le Pen says that the sun is orange, do I have to say that it is blue?”*) I must admit that the poster was far more updated on French politics than the newly arrived anthropologist. Quite a few demonstrators today had come to the conclusion that the interior minister obviously doesn’t love France as she is, so they suggested that he packs his bags and leave. The cup final is finished long time ago (Paris Saint-Germain led all the way from the 5th minute and won 2-1…). 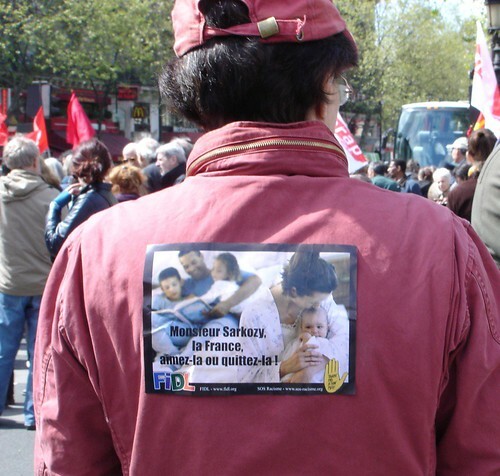 *) The exact quotes are "s'il y en a que cela gêne d'être en France, qu'ils ne se gênent pas pour quitter un pays qu'ils n'aiment pas" (Le Nouvel Observateur 28/04)« Si certains n'aiment pas la France, qu'ils ne se gênent pas pour la quitter » (Le Figaro and Le Monde 29/04) Le Monde 27/04 has published a more extensive interview with the interiour minister on the subjet.